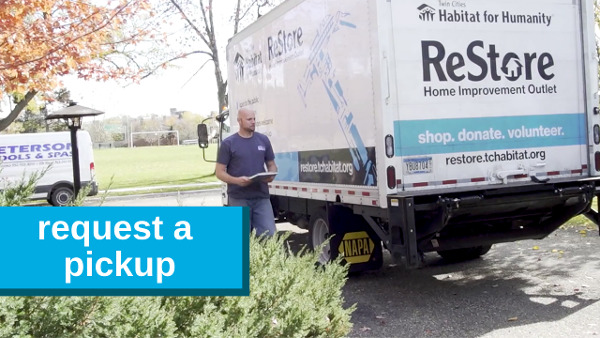 Donations made to our ReStores are tax-deductible and 100% of the proceeds support Habitat’s mission. Plus, you’ll be keeping good, reusable items in use and out of landfills. The Twin Cities ReStores receive new and gently-used donations from individuals, building supply stores, contractors, home builders, interior designers, and Twin Cities businesses. Donations can either be dropped off at either of our store locations, or, for larger items and donations, you may request a pick-up. Check out our Donation Valuation guide to see list of typical ReStore items at suggested range values for determining income tax deductions. "Easy to schedule online, drivers arrived promptly, gently packed up cabinets, provided a receipt and were off! Thank you for an easy experience." "Details on the site are very helpful. Pick up confirmation was timely and accurate. Driver was prompt and very courteous." "Super easy, convenient, and the pick-up guy was friendly and efficient." 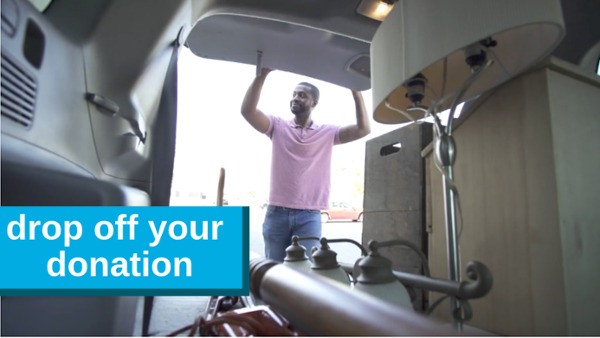 Learn more about dropping off donations at ReStore. Fill out the form and request a pickup. Saturday and Sunday: Sorry, we do not offer weekend pickups. Please take a moment to review our Accepted and Unaccepted Items list below. The purpose of this list is to provide a general outline for items we do and do not accept; however, it is not complete. We encourage you to fill out the form on this page with any questions you have regarding your donation. Refrigerator (no commercial, no built-in), freezer, stove, vent hood, washer, dryer. Less than 10 years old. Determine the age of your appliance at www.appliance411.com. No used dishwashers, wall or double ovens, microwaves, garbage disposals, cooktops. Mantles (factory painted or stained), columns, framed stained glass, wrought iron stairs, railings, and spindles. Drywall (4’x4’ or 4’x8’). Lumber (6 ft. or longer). Plywood (2’x4’ or 4’x8’). Baseboard, trim (6 ft. or longer). Remove nails, screws. No used deck wood, particle board shelving. Sinks, new tubs, medicine cabinets, new shower surrounds, vanities w/ top & bottom smaller than 5 ft., less than 20 years old. No used toilets, jetted tubs, factory molded sinks, cast iron sinks, shower doors or unframed mirrors. New carpet only, rolled. Must be at least 10’x12’. New rugs or professionally cleaned. Please write size on the back with permanent marker. No used carpet or carpet pad. Interior (wood and metal, bi-fold, glass). Exterior (metal or glass). Remove and bag door hardware. No hollow core, used shower doors, painted, mirrored doors, exterior wood, garage doors or openers. No mold. No electronic items (TVs, computers, CD/DVD players). Flooring: Hardwood / Laminate / Vinyl - New only! Couches & loveseats (pickup only), dressers, end tables, dining tables, chairs, side tables, home office desks (5’ or less). No pattern upholstery, bed frames, futons, office furniture, cubicles, 4-drawer file cabinets, entertainment centers, recliners, sofa beds. Knobs, hinges, nails, screws, nuts, bolts, boxes of fasteners, and locks. Drop-off only. No cans or jars of fasteners. New shingles, new insulation, new gutters. Seasonally accepted Apr 1 - Oct 31. No used gutters, shutters, new or used siding including Hardie Board. No garage doors or openers. No used vertical blinds, window coverings, unframed mirror or glass. Air Conditioners, furnaces, central air systems, water heaters. Residential size only. Seasonally accepted. Cabinets: doors/drawers/hinges attached. Less than 20 yrs old, stained or factory painted. Custom cabinets (6’ or smaller runs). Sinks, stainless only. Laminate countertops, new only (no holes). No solid surface or used laminated countertops. Lawn furniture, yard tools. Seasonally accepted Apr 1- Oct 31. No items with rot, damage, rust will not be accepted. No propane tanks, no gas or oil containers. No backyard play sets. No used fencing. Flush mount, chandeliers, sconces, lamps. Ceiling Fans drop off only. No shiny yellow brass, used light bulbs, track lighting, fluorescent fixtures or bulbs. Full or unopened cans of latex (5 containers or less per visit). Paint Supplies—brushes, rollers, paint trays. Drop off only. No oil-based or spray paint. New PVC and metal piping 6ft., fixtures, parts and supplies. No used toilets, water softeners, cast iron sinks or tubs. Power tools and hand tools. Aluminum or fiberglass ladders. No recalled items, stationary large power tools, table saws, radial arm saws or wooden ladders. New complete units with all sashes and frames. Metal screens. No single pane, used windows, wood screens, shutters. No automobile parts, children’s items/toys, clothing, electronics/TVs, exercise equipment, hazardous materials, mattresses or box springs, musical instruments, medical equipment, pesticides or fertilizers, pianos and organs, small household items, textiles, toxic chemicals.